The entry foyer has a pyramidal ceiling that vaults from 10' to 11'6", and it has half–walls with decorative square columns to differentiate the foyer space. Straight ahead you have views to the rear deck and beyond through the living room windows. 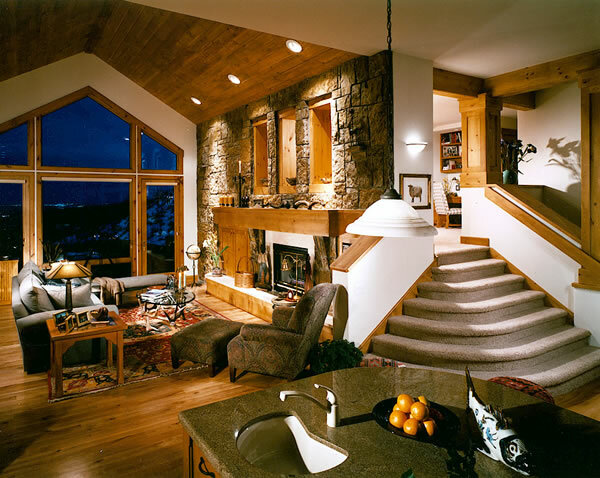 The wall of windows has transom windows above that reach the vaulted ceiling of the room. A glazed door at the side that opens to the backyard has a full height window next to it for additional light. A two–sided fireplace warms both the living room and the dining room located on the other side. The ceiling in the living room vaults from 9' at the edges to 12'3" in the center. To the right of the entry foyer you pass a powder room, a coat closet, and a staircase to the lower level before coming to the double doors that open into the master bedroom suite. The master bedroom has a 10' ceiling and is triangular in shape, with a fireplace located in the corner to warm the room. Triple sliding doors on either side of the fireplace open onto a private wrap around deck, which also provide lots of natural light and views in two directions. A door to the left as you enter the room opens into a large walk–in closet, and at the far corner of the room a door opens to a luxurious master bath. The bath features a private toilet area, a whirlpool tub beneath corner windows, a large separate shower, two vanity sinks, a linen closet, and a door to the rear deck. There is also a door from the bath to the walk–in closet for direct access. A truly unique suite filled with interesting angles and views! To the left of the entry foyer you pass a formal dining room before coming into the open public spaces. The dining room has a 10' ceiling, a fireplace, and a glazed door that accesses the rear deck. 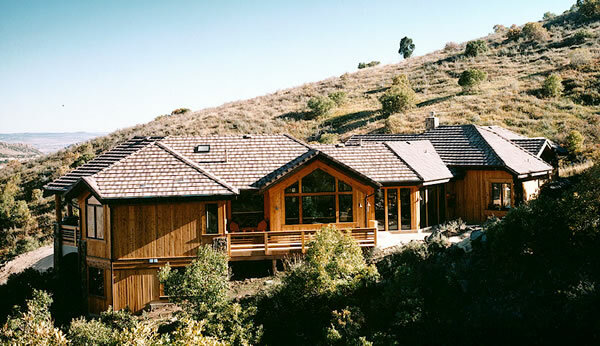 As you look around the flowing array of public rooms you are constantly aware of your connection with the outdoors, as the use of many large windows helps to create the unique character of this home. The kitchen, nook and family room get the best of both worlds: to one side a curved wall of windows provides views to the rear and side; while on the other side large picture windows and transom windows above them that reach the vaulted ceiling provide views to the front. A glazed door from the family room also accesses the front deck. Along one wall, a built–in entertainment center and a fireplace are incorporated into a stone wall. Interior window openings above the fireplace look down from the loft above. The ceiling in the family room vaults from 12' to a dramatic 16'8". The open kitchen has a large center island with a cook top and room for eating that separates it from the breakfast room. A short hallway between the kitchen and the dining room has a butler's pantry on one side and a large walk–in pantry on the other. The kitchen also features tons of counter and cabinet space, corner windows above the sinks, a desk, and a 12' ceiling. The sunny breakfast room features a curved wall of full–height windows with transom windows above them to bring in views and sunlight, and it also has a 12' ceiling. From the kitchen and family room area a curved staircase leads to the split upper level, and another set of stairs walk down to the laundry room (which has a lower ceiling height of 8'4") and the three–car garage. The second floor landing opens up to a loft space with openings that look down into the family room. The loft features a vaulted ceiling, a niche for a desk, and an arched picture window that looks out to the front. Two additional bedrooms with a shared Jack–n–Jill bath are located on this floor. Each bedroom has a walk–in closet, its own private vanity area, and some vaulted ceilings. Bedroom 3 also has a window seat that looks out to the front. The optional lower level has the potential of an office/ bedroom with a private bath, and plenty of space for additional entertainment spaces. 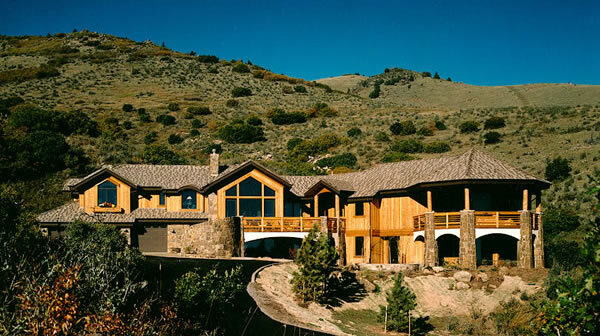 This stunning mountain home has two decks at the front – a long one that angles and ends at the front door, and another that wraps around the master bedroom – and one at the rear that wraps around the living room. And it enjoys views in every direction. The original lot was sloped to one side, so they included a walk out basement that was left unfinished, and they built a curving staircase to provide access to the front deck. The master suite is on one end of the house, and on the other end up a half level (again because of their lot) there are two more bedrooms over the garage. When you see the photo of the interior, you'll understand why we call this a magnificent house!